The idea behind the float test follows this line of thinking: If hair is porous, it takes on more water than if it is not porous. Therefore, porous hair might sink because it takes on water and becomes heavy. That is - the weight of the water the hair is absorbing overwhelms the power of surface tension (between water molecules) that keeps the hair suspended on top of the water. Porous, coily/curly (Type 4) hair which has been lightened (highlighted). When untreated, it did partly sink over time. But at least half of the hair was on the surface. With oil, it initially sank when dunked (all hairs were dunked in this case), but then floated as the coconut oil repelled water. With conditioner, the un-dunked hair floated until the end of the test when it was partly sinking but the dunked hair sank initially, then floated as the weight and specific gravity of the hair vs. water and the waterproofing of conditioner got the better of it. Hair gel in this case was similar to un-treated hair - though hair gel can make hair more water-attracting. Same as at 5 minutes. 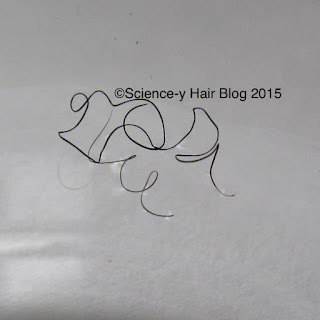 Mixed porosity hair (lower porosity at roots, porous at ends), loose curls with kinking. The untreated hairs all floated (none were dunked). The oiled hairs also floated. With conditioner, the wet-ability of the conditioner encouraged sinking, whether the hair was dunked or not. With hair gel, the wet-ability of the hair gel encouraged sinking. Low Porosity, coily (Type 4), kinking hair. 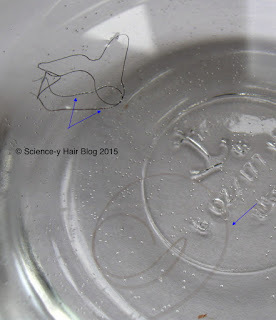 This hair floated as expected when untreated and simply placed on top of the water - but it seems the shape of the hair pulled it down when dunked. It floated when oiled both dunked and un-dunked. Conditioner's wet-ability encouraged some sinking with time, as did hair gel. Porous, wavy hair, which has been lightened (highlighted). The porosity of this hair encourages sinking when the hair was dunked. The hairs floated when oiled but conditioner's and hair gel's wet-ability encouraged sinking in the dunked hairs. Porous hair does indeed tend to sink somewhat reliably: 1) if the hair is clean - no products 2) over time, 3) if the hair is dunked under water first. Conditioner and hair gel on hair tend to encourage hair to sink if it has been dunked under water first - but it may float after a little while. The curl of hair or lack of curl or for that matter if you have hairs touching other hairs, may change the result, especially if you dunk hairs. Oiled hair tends to float - especially coconut oil. 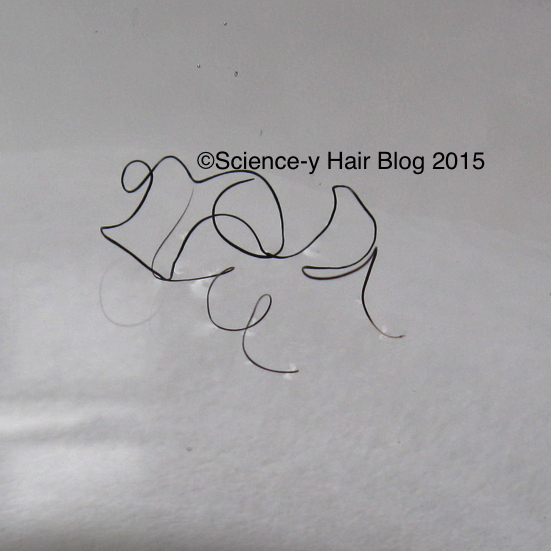 Dunked hairs vs. hair placed on the surface may produce a different result. And that result may change if you leave the hair for a few minutes. As you can see from the charts - whether or not a hair that sinks at first may float later on is not predictable, so I don't want to encourage you to try to predict a result based on whether it sinks and then floats. That's not accuracy. Can you get an accurate result with the float test? I am inclined to say no. If your hair is very porous like the porous hairs I selected and if it is very clean, then you might get a "porous" result. But if there is oil or conditioner or hair gel on your hair, or if it is just a little bit porous - you will not get an accurate result. If your clean hair is low porosity at the roots and normal or porous near the ends, your hair will probably float, or sink partly - but if it does sink - is that because you dunked it, because there was some conditioner residue, because it came into contact with the side of the container? What other forces are acting on the hair? How porous is it really? More information is needed! Of all the tools and products for hair, your eyes, hands, ears and mind are the most important. If oil and conditioner just sit on top of your hair, if you've never dyed it nor handled it especially roughly, it's probably lower or normal porosity. If your hair doesn't soak up loads of oil and conditioner, but can tolerate whatever a normal amount is for your hair length and thickness and curl pattern without getting greasy immediately and sometimes gets a little dry or lighter-colored, frizzy or flyaway or the ends start to look light (or invisible) - you're probably lower porosity at the roots, normal in the middle and more porous on the ends. If your hair soaks up lots of oil and conditioner and never seems greasy or weighed down and tends to be dry and brittle and always breaking - higher porosity. arrows indicate where hairs has sunk beneath the surface. Bubbles tend to appear when products are applied. You decide how to treat your hair based on your baseline observations and how it responds to what you do to it. This post has recommendations for keeping lower porosity hair or hair that is difficult to moisturize feeling good. This post is about hair that is low/normal/porous and porous hair can use protein (if it's not coarse) and oil pre-wash treatments and deep conditioning to your heart's content. If you use a heavy-handed oil application and see a glimmer of improvement, but you needed to wash your hair 3 times to de-grease, don't swear off oils. Just use less. Maybe a lot less. Observe, make a plan, experiment, observe again, adjust as needed. water. Bubbles tend to form when products have been applied. Start with clean hair - swish it around in some water with a drop of detergent if your hair has any products (including oils and leave-in conditioner) on it, then rinse and let it dry before testing. Make sure the hair will not come in contact with the edge of the container the water is in. Dunk the hairs quickly (and completely) under the surface of the water to break the surface tension. If your hair has chemically-treated ends and un-treated roots of significant length, cut the hair in half and test those areas separately. Instead of using individual hairs, tie 15-20 hairs together (with a hair if you can) because individual hairs have very little weight - a greater mass of hair can take on more water if it's porous for a more obvious result. 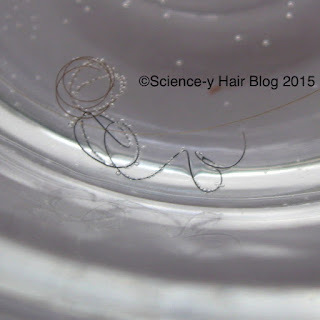 Hairs float at 5 and 10 minutes: Low porosity or low-normal porosity. Henna may give a low porosity result. Or may also be lower porosity roots and more-porous ends. Re-test the ends and roots separately! Hair partly floating, partly sinking: Possibly more-porous ends than roots if just one end is sinking, or porous hair if half or 2/3 of the hair seems to want to sink. Re-test the ends and roots separately! What is your opinion about using hair steamers on a daily basis to refresh curls or to facilitate the absorption of products? Does the heat/steam damage the hair on the long run? Is it really a good alternative instead of using water to wet the hair? Is it recommended/ good to use for all curl types? Thank u for your response in advance! I think hair steamers are helpful, unique tools and I have heard very positive things about them. I have a steamer myself. I think a lot depends on whether you are referring to hand-held steamers (Q-Redew) or bonnet type steamers. The Q-Redew (which I have, and I bought for myself) releases extremely hot steam directly from the steamer - but at the end of the prongs, the steam is a safer temperature for hair and skin. I have seen people comb through their hair with the prongs of that steamer and because the steam is nearly boiling at the outlet, that has potential to over-heat the hair. If it's a very short exposure, the hair may not over-heat. But if the hair is held neat the hottest steam for more than a moment, the temperature is near 212°F. That is too hot to be safe for hair and can damage (I mean cook) proteins. If the hair is held at the end of the prongs of a Q-Redew where it's less hot, it's probably just fine. I mean no disrespect to Q-Redew, I love their product and I use it regularly when it's not already humid outside. I have also burned my fingers on the steam at the outlet, and if I can burn my fingers, I'm going to burn my hair. So I keep my hair where the steam is cooler. Bonnet steamers allow a person to adjust where their head is in relation to the steam too. As far as I know, as long as the temperature of a bonnet steamer is not uncomfortable hot to the skin, it is fine for the hair. If you have long hair, you have to pile it on top for a bit so it gets steam too. Bonnets release more steam than hand-held steamers and you can steam more areas for more time because they're all done at once. If your steam is skin-comfortable - it's great for hair. Steam plumps hair with lots of water vapor, the warmth opens the cuticle gently (you only need to be a little above body temperature to do that) so more water can enter the hair. Hair becomes its most flexible, oils and conditioners can penetrate the hair if they're small enough molecules and the moisture and heat help oils and conditioners be more flow-able and well-distributed. You don't have to totally wet your hair - so there's almost no drying time and less stress on the hair vs. a complete wetting. Hair loves to be "watered" - whether that's steam or a mist of water (and whatever else) or actual wetting - whatever is practical. As for all curl types - we're all going to frizz in one way or another if we steam dry hair and don't add something to it. Some people add a conditioner or oil or curl cream before steaming (as refreshing/moisturizing hair) to help it soak in and some people do that again afterwards (or just afterwards) to pull hair back together and manage any frizz. I know some people just don't like the frizz that can come with steaming and decide it's not for them. There's probably still a little "styling" with steaming for everybody, post-steaming. Figuring out how it fits in a hair care routine and how much "other stuff" you need to add is just part of the learning curve in using steamers. Hi it's Adenike again lol so I believe I was low porosity when I stared the mhm. Bein impatient over time I started to add more baking soda and started doing the protein treatment more often while eliminating some ingredients. I wish I could show you pictures. Anyway my hair looked and felt great at that time. I had reached normal porosity. But then I started to notice that my curls were becoming way too loose. This was around early 2015 and ever since then I've been trying to repair it. I believe I might be high porosity now because of manipulating it so much chemically. Should I just start all over and do a big chop? Or leave it and let it grow out? Aw, I wish I could see pictures. If you had low porosity hair when beginning the Max. Hydration Method, and you increased the baking soda - that probably made your hair more hydrophilic (water, protein and conditioner and oil-attracting) - so more like normal porosity hair. And that can be a lot easier to work with when your hair doesn't turn its "nose" up at every product you try. If you did more protein treatments than usual, that can either over-soften hair (lose curl, lose volume) or it can stiffen hair so it feels dry and rough. If you're not using baking soda (if it were my hair, I would not use it at this point), then you can formulate a plan to see if you can get your curls back. Your hair's porosity and ability to attract water is probably different where it was treated with baking soda, etc. It needs a lot more humectants to stay hydrated and maintain its curl. If protein is too "iffy," go for panthenol in conditioners. It's a great humectant that has lasting effects, even after you rinse it out. Deep condition regularly. Do oil pre-wash treatments with whatever penetrating oil works for you (avocado, coconut, babassu, olive, sunflower) regularly. See how your hair responds to lots of humectants and hydration (the oil pre-wash helps your hair stay hydrated during and after washing). After you've done that for several washes - you might try some protein. But stick to products where protein is near the end of the ingredient list. See what happens. Somewhere in there, you should find something your hair responds to. Don't do a treatment of any sort again until the effects of the last one faded. If you see a positive response - keep working with it. Your hair may not be damaged like it might be if you had done more significant chemical treatments (relaxers, keratin straighteners), but it sounds like something is missing and with patience, you'll figure out what. 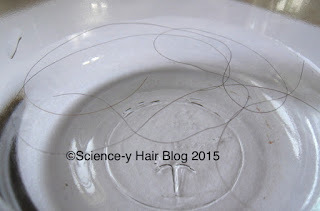 I have seen hair damaged quite a lot just by vinegar when I do hair analyses - everybody's hair has its own tolerance limits. I had some serious sun-damage last year and I couldn't get my hair to feel flexible and soft - no matter that I tried until I remembered this conditioner rinse-out method (in this link). http://www.thereoncewasacurl.com/blog/squish-to-condish I added water to the conditioner in my hair that night and worked it in and lo and behold, it got nice and slippery and heavy and clumped together and the curl reappeared. I was so happy I danced in the shower! So hazardous. I'm actually on this website http://dubaidee4c.blogspot.ae/2016/02/meet-ms-adenike-mhm-sister-shares-her.html At that time my hair was in its worst shape after doing mhm with the baking soda and the cherry lola treatment. I believe that my hair is now over-softened then from the protein treatments. I took out my hair yesterday from a protective style and i did and overnight prepoo. My hair was very easy to detangle this morning to my surprise. After rinsing it out i did a clay mask then rinsed it out. Afterward i sprayed a leavein conditioner. Also my hair was in twists throughout the entire process until i was about to wash the clay mask out. Now that it is dry i do have some elasticity but not as much as I use to and i do have some curl but not like before. I think that it might have been the twists that helped it out. Flax seed gel helps with my curl definition too! For the deep conditioning I have the eden body work jojoba monoi one. It always worked well after i would do a henna treatment. Thank you for the link! I think your hair looks good before and after - it's quite a change. Moderation is key for everything. Your hair seems to do really well with the MHM - in moderation. It does well with protein and henna - in moderation. If you keep using treatments as you need them - when the last one "wears off," you should re-gain a lot of your curl. Patience and persistence pay off! And what a lot you've learned in the process already. Flax gel is not only good for definition, it can help preserve hydration because it's a water-attracting film-former. You can add things like a little aloe vera or a little glycerin or any humectant your hair likes to your flax gel to help with hydration. You're welcome and thank you! :D i have one more question. I think I might have hygral fatigue.It does makes sense because all I've been doing for the most part are wash and gos. Sometimes i wouldn't even seal my hair. I've started reading up on it and it seems that the only cure for it is coconut oil as a prepoo. Would this also mean that i would have to stretch my wash days as well? What should I do? Also back to the henna, I believer that it really loosened my curls :( is there a way I can get them back? Ive heard of people removing the henna. I'm not too sure. It's really, really hard to remove henna. Most things used don't really work. Stick with trying coconut oil, occasional protein and see what happens. The clay treatment from the MHM would be fine too, if it helps your hair curl better, but if you add anything acidic, like vinegar, only use a drop or two. It's probably not a good idea to try a henna-removing treatment at this point, it could have unpredictable side effects, which just makes things more confusing. If you really, really want to try removing henna - save hairs when you detangle and wash, band them together at one or both ends and use it on them so you can see what happens without committing all your hair to the treatment. Give the zizyphus a try if you think it might work. I've used it. It's not quite as water-repelling as cassia or henna and it does add some texture and grip. But it does add an element of "water repelling" to hair - so you might want to do a test strand and see if that's something you want to do to all of your hair. If you're not sure - you can always keep that idea on the back burner and try things like coconut oil first. Hygral fatigue is a handy name for what happens to porous or really water-attracting and water-absorbing hair when it gets wet and/or stays wet too long. I've over-softened my hair plenty of times - that wasn't hygral fatigue, it was too much oil and conditioner. But the day I spent all day out in the rain and my hair never got dry from about 10 AM until 10 PM - that was some hygral fatigue. My hair was extremely weird until it got some oil pre-wash treatments and protein and some time to recover. When you use baking soda often, your hair becomes more water-attracting (more inclined to have hygral fatigue when wetted) - and henna should be taken up more by baking soda-treated hair. When you use henna, your hair becomes water-repelling instead - so that should have helped - at least for a bit. But it makes the whole situation kind of confusing. The coconut oil prepoo treatments will prevent your hair from swelling up too quickly with water - it makes hair act less porous. Definitely worth doing to see if it helps. If coconut oil makes your hair dry or brittle or crunchy, use babassu oil or avocado or sunflower instead. I would always use ACV more than I did with water when doing the clay mask. I'll use water from now on then! Thinking back to when I started the mhm my hair would take foreverrr to dry but it doesn't anymore. I will try ZSC though on some test strands. For the protein treatment i have used hydrolyzed wheat but it had to combined with a conditioner. I also went through your product by category list and I'm not sure what to use. Should I start with mild protein treatments and how often should I do them? Also now I really think I've been over conditioning my hair which is why my hair is too soft of course along with over doing henna. Does that mean I should shorten the time I condition and find a lighter one instead of a heavy one as well? I'm thinking a silk protein would be the most benefits to me since it creates a barrier on the hair which will also help with my elasticity. If you've been over-conditioning, you can get a less-intense conditioning by: 1) Decrease conditioning time 2) Don't use heat 3) Use little or no oil in the conditioner or oil-free conditioners. Or by deep conditioning less often. A lighter conditioner is a good idea for when you need that, too if it works well. Silk protein is a pretty safe protein to work with. You need about 0.5% to 1% to see/feel a result. If you're not seeing much from using that added to a conditioner, you might like Neutral Protein Filler. It's keratin and wheat proteins and amino acids and herbal extracts. You'd mix anywhere from 1/8 teaspoon of that per tablespoon conditioner to 1/4 or 1/2 teaspoon, but always start with less. It comes in little bottles and is quite inexpensive. Only use protein when you need it, your hair may not need it every wash day. Thank you soooooo much!!! I will try the silk protein first. I can do that once a week right? since i will be using a light conditioner with it as well. For the Neutral protein filler i looked it up and they all kept saying color before the name but i saw that it's used before dying the hair etc. So if the silk does not work i will try this. i can mix it with a light leave in conditioner right? ZSC will be my last option if none of the above work. So I bought everything but the silk won't come in until the second week in March. So I was thinking I would try the Protein filler first. I can still do this once a week right? Also would I do it before my clay wash or after? Neutral Protein Filler is "Colorful (brand) Neutral Protein Filler." That's the right one. I forgot, there is more to the name. I like a cautious approach because we can't always guess the right schedule for hair treatments until you're really familiar with the product. I think a cautious approach would be - if you wash once per week - to use 2 to 4 drops (it usually comes out in pretty big drops) per tablespoon of conditioner. See how that goes. If your hair gives you an indication that it appreciated that (shine? smoother? bounce? more curl? ), and if it's all good news, try it again the next week, but don't increase the amount of protein just yet. At some later date, if you're getting consistently good results - you might increase the amount. But you need time to experiment and make close observations. On the other hand, if your hair hints that it liked the protein, but you're pretty sure can get more out of it, add a little more next time. If you see no improvement, but no negative effects either, try a little more next time. If you use protein 2 weeks in a row the same way, and week #1 was great, but week #2 was not great, then you may have used it too soon. **If at any time your hair seems to feel more dry or tangly or anything you don't like - skip a week with protein and plan to reduce the amount you use if you want to use it weekly. ** Your hair will show you if you've used too much protein. It might get dry and stiff and tangly, or it might get too soft and limp and fluffy. You have to catch those signs and respond. I did the test and my hair strands from different area was floating in the middle for 10 minutes directly under the surface so does it mean my hair is porous or low to normal ? If you used very clean hair and dunked it under the water first - and got a "just under the surface but still floating at the surface" result - that might be interpreted as normal porosity. You might expect normal porosity hair to soak up enough water to no longer be floating on top (assuming you dunked it to wet it) after 10 minutes in the water. The hair still has its lower specific gravity than water, but it has taken on some weight from the water. I did the test but i want to make sure that i get it right my hair strands from different areas was floating directly under the surface but not hitting the bottom that means that my hairis porous , right ? Because i use butter and oils and protein treatment but my curls always looks like straws on the 3rd day and when i refersh my curls i will have horrible frizz ?does it mean that it is still lacking in moisture ?